Not really a casserole, but delicious just the same. 1 sm can of mushrooms packed in water, or 8oz package of fresh, sauteed. First I put the chicken in a skillet with a little olive oil. Then I got the rice boiling, I used 10 minute brown rice. Once those two things were on their way, I started into the sauce. Melt the butter in a sauce pan over med-low heat. Add the flour and whisk to combine. Add the milk and whisk whisk whisk. Making a cream sauce is a bit of a task, if you let it sit in the pan it will scorch so you have to keep whisking. It will take about 5 minutes to thicken up. Don't worry if it seems to be going slowly, it will thicken, just keep whisking! Once the sauce has thickened, dump in the mushrooms. At this point, I threw some broccoli in the microwave for a few minutes, this is optional but I love it. 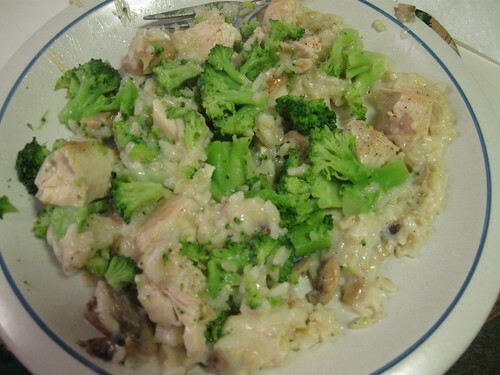 Once the chicken, rice and sauce are all done, combine into one pan, stir in the broccoli, and serve! Yum, just like I remember, but without all the additives and preservatives of Campbell's. Eventually I'll figure out how to make this a one dish casserole, but this was easy enough too. I also read the can of their Cream of Chicken soup and it looks to be okay as well! Yuuuuuuuum. This looks amazing and looks easy to convert dairy free as well! i actually think I'm going to make this tonight - just came back for the recipe & looked at the pic again -- is that rice pilaf I see??? Glad you want to try it! No, not pilaf, it's just plain brown rice. 2009 is looking good so far. It's a slow week in blogland.